Last week I attended the 7th Annual Remote Presence Clinical Innovations Forum hosted by InTouch Health in Santa Barbara, CA, a two-day users conference disseminating the latest information regarding a wide range of telemedicine-related topics through presentations and workshops. The keynote address, by Yulun Wang, Chairman and CEO of InTouch Health and Colin Angle, Chairman, co-founder and CEO of iRobot, Remote Presence’s Future: From Enabling Access to Coordinating Care, provided the platform to announce and display InTouch Health’s new RP-VITA telepresence robot which autonomously brought itself onstage skillfully avoiding a few obstacles. 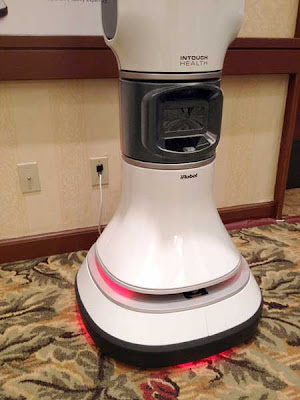 InTouch Health has installed their remote presence robots and portable devices in hospitals all over the world, and their devices are used more frequently year by year. In his keynote speech, Wang said they were in “500 hospitals and have 60,000 high acuity consults a year now, and growing at a nice clip.” This is up from 300 hospitals and 20,000 consults two years ago. After the address I spent a few moments with Colin and asked him about iRobot’s role with InTouch and about their goals for their new mobility platform. I saw and played with the new RP-VITA robots and they are truly slick. But the most enlightening thing I saw was four hours of tightly-packed presentations by critical care doctors and hospital administrators, all users of InTouch Health’s remote presence robots, and all portraying different aspects of why remote presence in health care is relevant, is saving lives and is necessary today and why it will continue to be in the future. A Trauma Telemedicine outfit from Halifax, Canada is providing pre-natal care in a Third World South American nation. They are using InTouch Health’s portable remote presence devices with a traveling nurse to assist in taking and discussing ultra sound exams and other pre-natal treatments with health care professionals in Canada for rural pregnant women. Two hospital systems (one in Florida and the other in Pennsylvania) are letting their patients see their doctors by telepresence at nearby local facilities using InTouch’s robots and other telepresence technology thereby making in unnecessary to drive to a big city university hospital. Virtual tutoring was presented – in which an amazing feat of software was shown – superimposing the consulting surgeon’s hands over the view of the actual surgery so that it could be seen and discussed by both the consulting and on-site physicians. Robots were used to provide admitting and initial diagnosis — one system actually has a 7 pm to 7 am robot shift. Nurses commented that by using the robots they could quickly get nighttime help and, because of the cameras and two-way dialogue capabilities, there has been no disagreement about what is seen by each of the various people involved. A survey at one hospital utilizing InTouch robots showed a reduction of length-of-stay by 1+ days, the average patient census was down by 1, and there was an increase in cases by 9. In a couple of presentations, a mobile robot was hooked up to the ballroom speaker system when the speaker had to be in two places at the same time. One doctor was a team physician for an Olympic soccer team in London; another missed a plane and was using his laptop at the airport to operate the robot on the stage. There was one testimonial after another — and that was before the announcement of the new RP-VITA robot! Also, the new RP-VITA specs contain a simple-to-use iPad interface for navigation and interaction with the patient and health care team. Thus, with the Aware2 operating system and software developer kit (SDK), and an iPad SDK both available to developers, thousands of developers can provide applications for a single, solid, proven platform. Over the past 10 years, InTouch Health has been modifying it’s remote presence products to adapt to what health care professionals have needed. They gradually came to the conclusion that one methodology doesn’t fit all needs. Enabling a doctor to be in two places at once involves a whole series of products and systems. Currently they have three very capable solutions to those remote presence needs: a portable Xpress device for ambulances and remote locations unfriendly to mobile robots; a portable operating room station (Vantage and Lite); and the new mobile VITA robot. The swiveling wide-angle and zoom cameras and monitor and the two-way communication are integral parts of all of their products. The general purpose of each product is to easily perform real-time consults with patients and other physicians and health care providers through the use of secure interfaces supported by a speedy and secure network infrastructure. As a pioneer in the field of health care telepresence, InTouch Health has had the unenviable task of keeping up with technological change while offering state-of-the-art remote presence robotic products. The release of this new RP-VITA robot and the partnership with iRobot, indicate how this new venture is paying off: the integration of new iPad apps integrated with the iRobot platform and an API making further clinical apps easily available, InTouch seems to have a viable forward plan. Visiting Nurse & Hospice of Vermont and New Hampshire has leased four VGo robots for a pilot program. They will be on site to supplement nurses in homes of patients in the group’s hospice to allow medical specialists in other locations to have live consultations about the case. Another pilot program using VGos is under way with Children’s Hospital Boston where the hospital sends VGos home with kids after their operations so that doctors can check on their young patients once they’re home and talk with parents or caregivers about their care. Giraffs are being placed by visiting nurses where frequent contact is desired. Giraffs can also be used by family members for communication and video conferencing. Certainly, the joint venture with iRobot has freed InTouch to focus more on what it does best and leave the driving to iRobot.